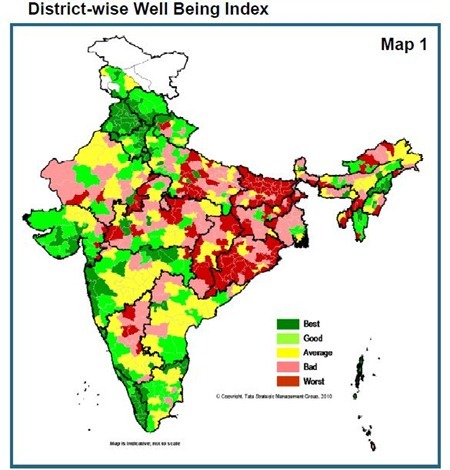 Southern India stands out when it comes to general well-being of citizens, so does Western India as compared to other parts of the Country. In eastern parts of India people lack well being, while in North India scores very low when it comes to Female Security. These are some of the findings of report released by management consultancy firm TSMG (Tata Strategic Management Group) on the Well Being Index (WBI) and Female Security Index (FSI). It is interesting to note that some of the economically and socially well-off districts (Which rank best on well-being index) are among the most insecure places for women to live. One such district is the Capital’s business hub – Central Delhi – which ranks ‘best’ on the Well Being Index (WBI), but ‘worst’ when it comes to Female Security Index (FSI) in India. 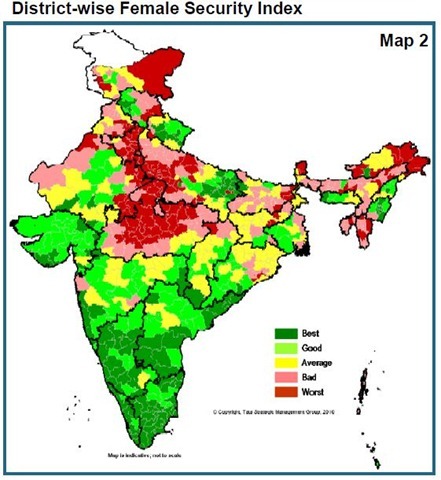 The Northern states of Punjab, Haryana and Delhi are amongst the best. Koppal and Gadag are amongst the ‘Worst’. while it is exactly opposite for districts in Punjab, Haryana, Madhya Pradesh, UP & northern region where most districts are voted “worst”. and Kota are among the ‘Worst’. This is too risky. In the capitalistic mode of wealth acceleration, the gap will only widen and adds too much friction. Something has to be done to bring up every state together on same lines.